WARNING: THIS REVIEW WILL CONTAIN SPOILERS FOR THE STAR TREK AND STAR TREK INTO DARKNESS MOVIES. The five volumes of the “Countdown to Darkness” comics are bound in this paperback that explores Khan Noonien Singh’s past. THE PLOT: The Khan of Star Trek Into Darkness (Bennedict Cumberbatch) is on trial for his crimes. But Kirk points out that he can’t even be Khan, because he looks nothing like the real Khan (Ricardo Montalban). What follows is an explanation that ties the Original Series in with the skewed timeline of the new movies. MY TWO CENTS: I kind of love that they did this story. I’ve been a Trekkie (Trekker? I don’t care) for more than 25 years. I was surprised to find that the reboot was acceptable to me. (Well, I wasn’t surprised about Zachary Quinto. He’d be more than acceptable no matter what he did.) But that doesn’t mean I like all the history being lost. This was someone’s brilliant idea of marrying the two timelines. 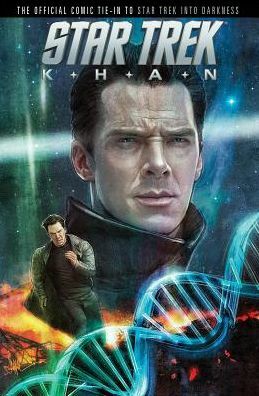 Oh, but they do kind of offer an out as well, so if you have already established in your head that Khan was ALWAYS “John Harrison,” then you’ll still be okay. It’s mythology for everyone. BOTTOM LINE: If you spent the entire second movie saying, “But Benny Batch CAN’T be Khan, because the timeline didn’t skew that early!” then you need to read this. It’s also an entertaining story about Khan’s childhood, rise to power, and ultimate trip on the Botany Bay. TEACUP RATING: Five out of five teacups. Love it. ON SALE DATE: The book will be available June 3, 2014, in paperback. All volumes of the individual comic are available now.